Romilly Squire was the fun-loving heraldic artist whose oevre was a new genre of heraldic design hailed in several quarters as the best in a generation. His encyclopedic knowledge of heraldry, combined with his then position in 2008 as chairman of the Heraldry Society of Scotland, saw him emerge as the heavyweight critic of an apparent coat-of-arms then being flaunted by Donald Trump. Ahead of planning permission being given for the Trump golf course at Menie, north of Aberdeen, the Trump organisation had produced a range of promotional material including jackets and baseball caps bearing Mr Trump’s “coat-of-arms”. Mr Squire roundly suggested that the “heraldry” had been designed by an amateur, and that the whole achievement had been “put together for aesthetics, rather than reflecting anything about the bearer”. The usually mild-mannered Squire continued: “These so-called arms break a number of conventions, and it looks as if it (the coat of arms) had been put together rather than reflecting anything about the bearer”. Mr Squire went further, pointing out that in place of a motto was the name Trump, a solecism unworthy of further explanation. An unnamed heraldist referred to the incident as “the waive of a crest”. George Sorial, Trump’s right-hand man, tried to explain that the insignia was something Trump had had "for quite some time" and it had been properly registered with the US patent and trademark office. He added: "I believe it's the Trump family crest......It is my understanding we can't use it and we have removed it from our website, our envelopes, our letterheads". 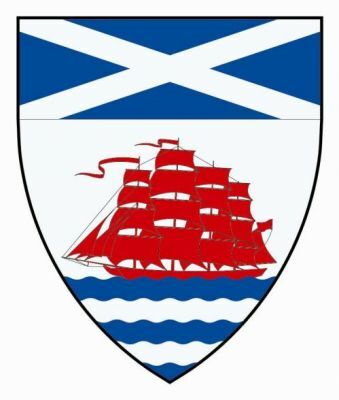 Shortly afterwards, entirely unconnected with the Trump affair, Romilly was commissioned to design a version of the Royal arms of the United Kingdom as used in Scotland for use in the main hall of the Scottish Parliament at Holyrood. Carved in wood by W H Stevens, the work depicts arms with Scottish quarterings, with Scotland’s unicorn as principal (or heraldic dexter) supporter. His interest in heraldry developed at an early age, with Arthurian legends sparking a passion for arms and armour, chivalry and heraldry. Above his childhood bed in Glasgow hung Don Pottinger's chart Scotland of Old, firing the young Squire’s imagination with images of romance of a bygone age. Glasgow-born, Romilly enjoyed what he himself described as “an unremarkable education at the High School of Glasgow”. He went on to study graphic design at Glasgow School of Art, benevolently influenced in choice of higher education by his father, the distinguished portrait painter Geoffrey Squire, long a lecturer at the GSA and later a governor. On graduation and with teacher training behind him, Romilly returned to Glasgow High School to teach art for six years. This was when he turned to heraldry, producing armorial artwork for family, friends and for his own enjoyment, with his greatest influence being the work of Don Pottinger, heraldic artist, Lyon Clerk and Islay Herald – Pottinger being quite the most innovative heraldic artist in a generation, and major influence in his time in world heraldic design. When Romilly’s work came to the notice of Sir Crispin Agnew of Lochnaw Bt, long-serving officer of arms at the Court of the Lord Lyon, there emerged an invitation by Don Pottinger to move to Edinburgh to become a herald painter at Lyon Office, a post Mr Squire held for some two decades. Romilly’s talent lay in producing design that was bold and simple, layering his work with energy and elegance. He brought life to colour, cross and creature, imbuing vivacity in the simplest of charges. There was never a lion that lacked a glint in its eye, nor a castle where the battlements didn’t frown, nor a sabre that well-nigh rattled. Substantial recognition came to him when in 1996 he was invited to participate in the world’s first artists’ workshop at the International Heraldic and Genealogical Congress in Ottowa – with the outcome being that his work was exhibited in the Ottowa Museum of Civilisation, and he was awarded the Corel Prize. Now considered one of the finest heraldic artists of his generation, he was invited to become advisor to the Chief Herald of Ireland on the renaissance of that office in 1998. An armorial from his desk would bear signature hues of brightest tinctures, and he succeeded in pushing the use of colour to achieve heraldry that shone in brightness without ever appearing gaudy. Romilly invested passion in his work. He treated some colours with scorn as being “too mild”, and instigated Europe-wide hunts for special paints of the hues he wanted. He would plead with friends visiting mainland Europe to take time off to try to locate particular brands and tones of Azure or Or rumoured to be produced in odder places. While his CV reads easily enough - elected a Fellow of the Society of Antiquaries and of the Royal Society of Arts; serving on the committee of the Heraldry Society of Scotland, editing their journals and newsletters, and ultimately becoming chairman for two terms 2002-2008; being appointed Officer of the Order of St John, and taking up post as Limner to the Order in Scotland; and serving as secretary of the Standing Council of Scottish Chiefs – it masks the man. He had second and third careers as model and actor, in the latter having a part in the 1975 film Monty Python and the Holy Grail, while as a writer, the many publications to which he contributed in whole or part include Gem Pocket Tartans (Collins), Kings and Queens of Europe and Kings and Queens of Great Britain (Elm Tree Books), Clans and Tartans (HarperCollins) and the magisterial Collins Encyclopedia of the Clans and Families of Scotland. He also illustrated Clans and Tartans (Regency House Publishing), Scottish Tartan Weddings (Hippocrene Books), and the Illustrated Encyclopedia of Britain (Readers Digest). He took up sport as a young man, having a fascination for kendo, the Japanese art of fencing, and in 1992 was awarded 4th Dan by the All-Japan Kendo Federation, and went on to teach the martial art, even taking up running for a spell in 1987. He was an active freemason, becoming Past Master of the Lodge of Holyroodhouse (St.Lukes) No 44. Romilly travelled much - to study foreign heraldry, to attend Highland Games to proselytise the cause, and to lecture on the subject. One of his most memorable presentations from a Far East trip was a learned and insightful account of the Japanese system of mon. If Romilly had a passion beyond heraldry, it was for orders and decorations – and these he amassed as others might collect stamps. He was an Officer of the Order of St Lazarus (1998), Grand Officer of the Imperial Order of the Star of Ethiopia (2000), Member of the Noble Compania de Ballesteros Hijosdalgo de San Felipe y Santiago, Spain (2010), Knight of the Order of the Eagle of Georgia (2010), Knight of the Imperial Order of St Anne, Russia (2011), Knight Grand Cross of the Order of St Michael of the Wing, Portugal (2011), and many more. On appearing at one formal dinner and being asked about his impressive line-up of miniatures, he replied with a wink: “Ah, but what you see are merely the ‘edited highlights’”. Nor was he one to disdain the use of ancient titles: he himself managed to acquire the feudal superiority of Rubislaw (an area now contained within present-day Aberdeen), and thus the territorial designation “of Rubislaw” became legally part of his name. Wit, raconteur, bon viveur, Romilly could sometimes enjoy life too much. He became ill within the past year, and died in Edinburgh after 10 days in hospital. His long-term partner was Andrea Seath, and he is survived by her and his sister Susan. His legacy remains the indelible mark he made on the design and practice of Scots heraldry. Romilly’s love of ceremonial was acknowledged by a funeral hatchment displaying his own arms, and painted for the occasion by Mark Dennis, fellow artist, advocate and officer of arms. The hatchment bore the slogan: Ars longa vita brevis (“Life is brief yet art endures”), a reflection of Romilly own motto (translated) Nature is more powerful than art.